The Animal On The Mountain. Mary and Donald, Tommy’s Granny and Granddad, went to France to see the mountains, which were like huge, tall pointed hills with snow on top. They looked very rocky and difficult to climb. Mary decided she would not try to climb the mountains. She would just walk around the bottom of them where there were lovely flowers called alpine plants. As Mary and Donald got ready to go on a mountain walk they put bottles of water and some biscuits in their rucksacks. They carried raincoats and wore sun hats. You can never tell what the weather is going to do in the mountains. It can be quite cold or very hot. Sometimes there are thunderstorms and very heavy rain. Mary wanted to be ready for anything. They decided they would try to go and see a glacier, which is a frozen river of ice. When you go on a mountain walk you zig-zag up the sides of the mountain so that it doesn’t feel too steep to climb. Mary had her two walking poles with her to help her go uphill more easily. It was bigger than a rabbit and a smaller than a badger. It had little short legs and it moved a bit like a rabbit or perhaps a cat. It did not hop. Every few steps it flipped its wiggly tail, which was longer than a rabbit’s ‘powder puff’ tail. It had little short rounded ears. ‘I don’t think it would be happy in a box,’ said Donald. ‘We could make a big run for him then. Oh I do want a marmot for Tommy! I’m going to try to catch one!’ said Mary and she went scrambling over the rocks towards the marmot. It sat and watched her struggling with her sticks, then just before she got too close, it popped down a hole in the ground. Mary tried again and again to catch a marmot, but it was too difficult. Mary was determined to bring a marmot home for Tommy. ‘I will just have to buy one in a French pet shop,’ she told Donald. The pet shop man smiled a sad smile, ‘Very sorry madam,’ he said, ‘we do not sell marmots here. Nobody sells them. They belong in the mountains. That’s their proper home. They don’t like to be kept in a cage. They like to be out on the mountain eating the alpine plants.’ Mary was sad. She told the pet shop man about Tommy and how much he might love one, just like Antony did. ‘Why don’t you buy Tommy a nice furry toy marmot? He can play with it and stroke it and talk to it and he will not need to feed it. And his marmot will not be unhappy like a real one would be.’ said the pet shop man. Mary smiled a big smile ‘Ah yes, now that is a good idea! I’ll get a toy marmot!’ So she did and it’s on its way to Tommy right now on the boat to Ireland. What sort of animal did Mary see living in the mountains? How big was it? Did it look cuddly or fierce? What did Mary want to do to the marmot? Why could she not catch one? Would it be a good idea to keep a marmot as a pet? Why not? 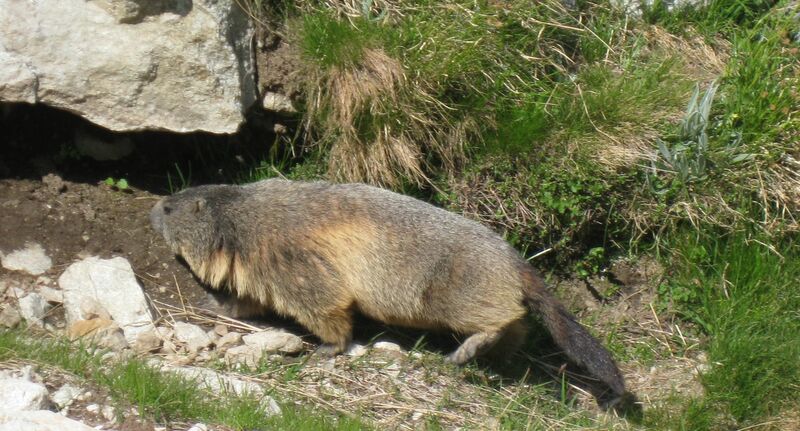 What sort of food do marmots eat? What did the pet shop man tell Mary to do for Tommy, instead of bringing a real live marmot home?